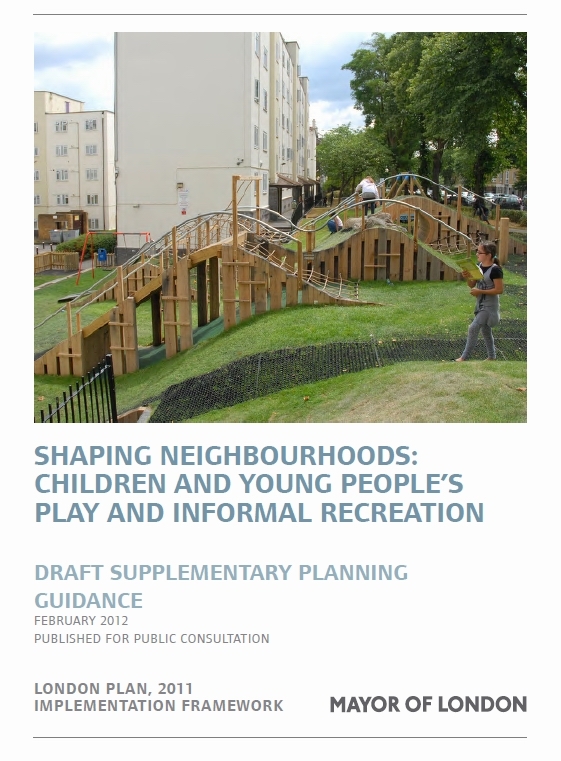 The Mayor of London has today released draft revised planning guidance for outdoor play, entitled Shaping Neighbourhoods: Children and Young People’s Play and Informal Recreation. The document shows that London’s decision-makers continue to take seriously the play needs of the capital’s children and young people. 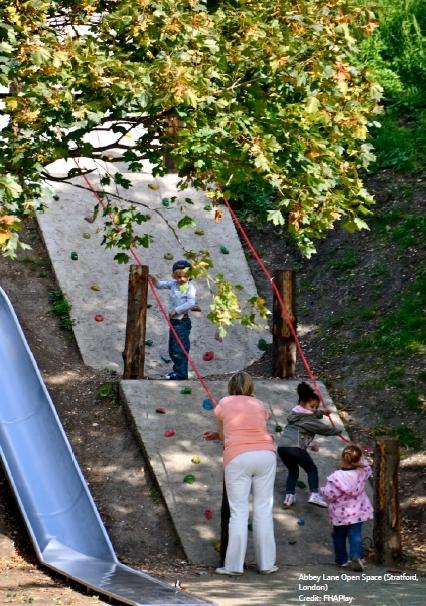 The core elements of the first version are still there: the requirement of 10 sq m of ‘playable space’ per child; a simple typology of play spaces of different sizes; clear tools to address access; the emphasis on inclusion; and the promotion of playful, creative, multifunctional, flexible approaches to design. Obvious improvements include a greater emphasis on nature (a strong response to my Sowing the Seeds report) and new material on community involvement and the role of volunteers. There is also updated information on technical planning matters, and a new spreadsheet for calculating requirements for play in new housing developments, which could be very useful. One thing that strikes me is the number of great images of play spaces – many of them in London. When EDAW and I were drafting the first version back in 2006, we struggled to find inspiring case studies from the UK. The existing guidance has been in place since 2008. As I mentioned in a post last summer, the Mayor’s planning team has been leading on the revision. I would have liked to have seen a proper assessment of the impact of the current guidance, as this is obviously the point of the exercise. However, officers have been actively engaging stakeholders from the play sector and beyond, and it looks like the document builds effectively on the current approach. Central Government’s ‘localism’ agenda is leading it to propose dramatic reductions in its guidance on planning. As Play England has argued, there is a real risk that children will lose out in the pursuit of short-term economic priorities. Given this shift, the Mayor of London’s guidance provides a model of child-friendly policies that can and should be promoted and taken up in other towns and cities. What do you think? Is the new guidance about right, or are there gaps or flaws? I’d love to hear your views – and I am sure the planners in City Hall would too. The consultation runs until 27 April 2012. This entry was posted in Outdoor play, Play spaces, playground, Public policy, Public space, Urban planning, Urbanism and tagged child-friendly cities, planning policy, playground, public space, urbanism. Bookmark the permalink. I’m enjoying reading this, I have to admit. It’s not what I expected from the mayor’s office. Two things I immediately thought the guidance did well were: emphasising the concept of ‘playability’ and playable space (as well as the need for different types of playable spaces), and making sure attention was paid to other contributing factors, like vehicle traffic, routes to play, social attitudes, etc. I definitely saw the need, though, as you did, for more attention to nature and natural environments – really not much there! One small part that really delighted me was the case example of Clapton Common Playground. I’m fairly sure I’ve seen it before, but I really had no idea that that much care and attention had gone into ensuring it would accommodate the needs of the local Hasidic Jewish community. Good work, planners! Also, am I the only one who is horribly and sadly amused by the one lone ‘Nature’ tree (at Highgate New Town)? Poor lone nature tree. You have no other case studies to accompany you as you diligently promote natural play. Daniel – thanks for these comments. I’ll take credit for developing the idea of playability, which stems from some creative thinking about play in urban areas and was in the first version. The emphasis and discussion on contributing factors has also been in from the start. However, unlike playability I am not so confident that this is seen through when the guidance is applied – that’s one of the issues I’d like to see reviewed. As for the ‘nature tree’, having visited that site a number of times, there’s more to it than that structure. That section also mentions Kilburn Grange, which has a rich array of naturalistic outdoor offers. But there may well be a need for a greater emphasis on this. I’m curious, Tim, do you get the sense that the ‘localism’ agenda will simply translate to planners ignoring most extra guidance like this completely, in favour of the ‘quick’ and ‘efficient’ solution? Or will there still be enough due process for these issues: would local councils and communities, for instance, have outlets that will allow for people to personally advocate for this guidance to be considered and implemented? I’m definitely wondering about the follow-through, as you said, but I’d (perhaps optimistically) like to think there’s still a way for this guidance to be promoted and adhered to in London. Many of these considerations for play don’t seem to require a lot of financing, for one thing – they just require planners to think through them and find creative solutions. What is your feel on this? Daniel – re: localism: London is in a strong position precisely because the Mayor has a big influence. And you are right: many of the measures are not expensive, they just need some creative, proactive thinking. I am worried about almost everywhere else. In my experience existing local planning guidance on outdoor play is weak, poorly thought-through and badly implemented. Government talks about handing power back to local people. My fear is that in practice the concerns of children and families will be neglected, because child-friendliness and play opportunities are rarely a priority for the people who tend to have the time and inclination to get involved. Combined with the loss of major funding streams from the Lottery and national programmes, the prospects for local investment in play look pretty grim.